While the concept of emergency management has existed for a number of years, significant events throughout history have changed the focus on what the State’s emergency management priorities are and how Western Australia and the nation deal with emergencies. The period between 1961 and 1974 saw Australia experience a number of significant natural disasters including the Dwellingup Fires in Western Australia (1961),​ the Black Tuesday fires in Tasmania (1967), the Brisbane floods in Queensland (1974) and Cyclone Tracey in Darwin (1974​). These events highlighted the need for a systemic manner in which to plan for, respond to and recover from natural disasters. In 1972 the concept of Prevention, Preparedness, Response and Recovery (PPRR) was introduced in the US and was soon after adopted in Australia. This remains one of the underlying philosophies of emergency management today. Perhaps one of the most significant changes to emergency management in WA was the implementation of the Emergency Management Act 2005 (EM Act). The EM Act establishes the creation of the current State Emergency Management Committee and the policy framework that supports all aspects of emergency management being, prevention, preparedness, response and recovery. Today emergency management is very much a collaborative effort. With an increased awareness of cross-border hazards there are joint initiatives in place across state and federal agencies. The Law, Crime and Community Safety Council (LCCSC) are the ministerial council that provides national leadership in emergency management and disaster resilience policy. LCCSC is responsible for overseeing implementation of the National Strategy for Disaster Resilience. Emergency management in WA is similarly a coordinated operation, as multiple organisations and all levels of government work together to maintain community safety and increase resilience against emergencies and disasters. Under Australia's constitutional arrangements, state and territory governments have primary responsibility for emergency management within their jurisdictions. However, all levels of government acknowledge that the impact of some emergencies could be particularly severe or widespread, and exceed the capability of a single state or territory. When the total resources (government, community and commercial) of an affected state or territory cannot reasonably cope with the needs of the situation, the state or territory government can seek assistance from the Australian Government. The Minister for Justice is responsible for disaster-related matters. A division of the Attorney-General's Department, Emergency Management Australia is responsible for planning and coordinating Australian Government assistance to the states and territories under the Australian Government Crisis Management Framework. Coordination of these functions is carried out from the Australian Government Crisis Coordination Centre (CCC) within Emergency Management Australia. Additionally, a number of National plans exist, that can either be activated either in support of the State EM arrangements, or under which WA EM agencies may provide assistance in response to national and international emergencies. 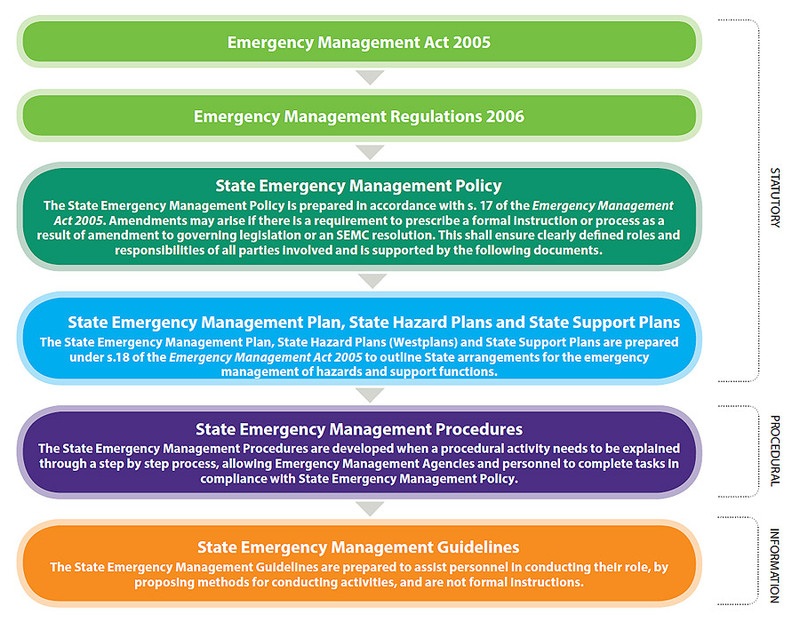 The SEMC Emergency Management (EM) Framework consists of a range of documents, including legislation, policies, plans and procedures detailing information on EM in Western Australia (Figure below). To facilitate EM in Western Australia, local governments are grouped into 11 geographical EM districts. EM districts are established by reference to the boundaries of local government districts in accordance with State EM Procedures. The District Emergency Management Committee (DEMC) is to assist in the establishment and maintenance of effective EM arrangements in the district. DEMCs are to develop individual business plans that set out strategies to achieve key outcomes and are closely aligned to the SEMC strategic plan. See the District Emergency Management Committee webpage for further information. Local Emergency Management Committees (LEMCs) are to be established by the local government to assist and provide advice in the development, review and testing of local EM arrangements. LEMCs have a planning focus and are not operational or response orientated. Significant EM issues that arise at the local level are to be escalated to the DEMC representative for the area. See the Local Emergency Management Committee webpage for further in​formation.